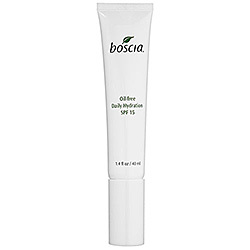 I recently tried the Boscia Oil-Free Daily Hydration SPF 15. I have combination normal-oily skin and found this moisturizer to be way to drying. It made my skin flaky and tight after I washed it. The moisturizer did not leave my skin feeling smooth and refreshed like a good moisturizer should. I got this product for free from Sephora and I definitely would not buy another one. On sephora.com the product gets pretty good reviews, so maybe it just does not work for my skin. The product is natural and does not have any parabens, which I value in skincare. If you have normal to oily or oily skin I would definitely not recommend this product! I am glad you got it for free!